As the .de in the name suggests, Bitcoin.de is a Bitcoin marketplace based in Germany. First of all, it’s important to note that this isn’t a traditional Bitcoin exchange such as Bitfinex or Bitstamp. The best comparison to make is with LocalBitcoins in that it’s a platform that connects buyers and sellers, much like an online marketplace such as eBay. On Bitcoin.de, it’s possible to buy and sell Bitcoin (BTC), Bitcoin Cash (BCH), and Ethereum (ETH). Owned by Bitcoin Deutschland AG, Bitcoin.de has an association with Fidor Bank. The platform itself is easy to use. The sign-up process is fairly simple, but advanced verification is required. Prices found on the platform are based on supply and demand, much like with any Bitcoin exchange. Bitcoin.de aims to provide security to buyers and sellers of Bitcoin. Users are assigned a trust level, which instills greater confidence in buyers and sellers. 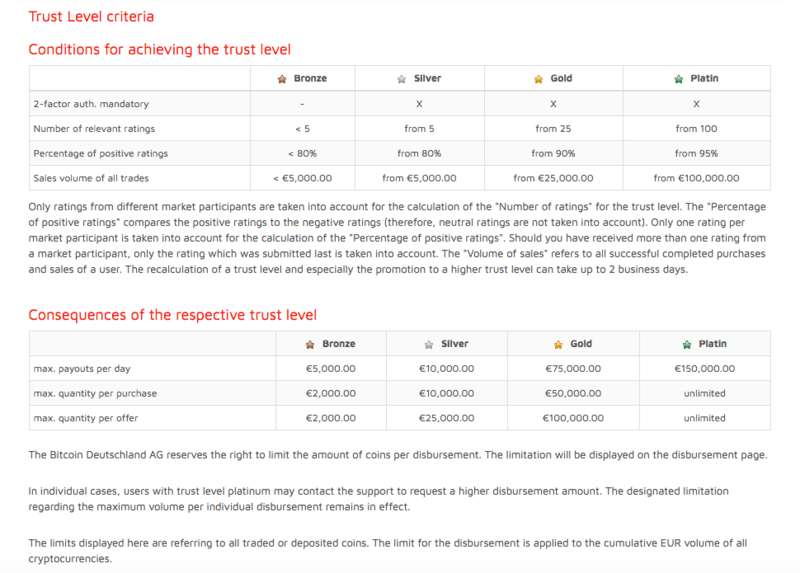 It’s all quite simple: trade deals that are successful and result in a positive user experience raise the trust level, while negative experiences can lower the trust level. Both the buyer and seller are able to rate each other, and this system encourages fair and honest behavior from users. A user’s trust level affects the amount of Bitcoin he or she can buy or sell as well as how much the user can withdraw from his or her account. In terms of fiat currency, Bitcoin.de only supports the euro. The following pairs are available at present: BTC/EUR, BCH/EUR, and BTC/ETH. In order to be able to start trading, you have to link a bank account to your user account. Even if you transfer one of the three accepted cryptocurrencies to Bitcoin.de, you’ll still need a connected bank account to withdraw funds. When it comes to depositing funds, you can do so via a SEPA bank transfer. Having a Fidor account offers a number of advantages (this is due to the link between Bitcoin.de and Fidor Bank), including real-time trading via the express trade feature. Bitcoin.de is available across Europe. The only fiat currency supported is the euro, and you can deposit via a SEPA bank transfer. The website itself supports the following languages: German, English, French, Spanish, and Italian. There’s also a Google translate option if you’re not from one of the aforementioned countries. There are two tiers of marketplace fees on Bitcoin.de based on the value of the transaction in question. If a trade is processed via the express trading system, there’s a fee of 0.8%. However, if a trade is processed via a SEPA bank transfer, it’s slightly higher at 1%. These fees are higher than those of many cryptocurrency exchanges. However, it could be argued that it’s a small price to pay for the security offered by Bitcoin.de. It’s also possible to find higher fees elsewhere, particularly when it comes to buying Bitcoin by credit or debit card. The marketplace fee is split evenly between the buyer and the seller, which seems fair. Bitcoin.de withdrawal fees are based on the current fees charged by the respective network (Bitcoin, Bitcoin Cash, or Ethereum). These fees are adjusted on a regular basis. As users of Bitcoin will know, fees have increased significantly over time as Bitcoin has gained popularity. Bitcoin.de doesn’t keep any of the withdrawal fees. Instead, they’re forwarded to the network. It’s possible to raise the withdrawal fee in order to increase the chances of the transaction being verified sooner. One of the disadvantages of Bitcoin.de is its comparatively high trading fees. However, this disadvantage is offset by the excellent customer support it offers. Cryptocurrency exchanges aren’t known for offering good customer support, so this marks a welcome change. You can contact Bitcoin.de via an online booking form. They’re generally fairly quick to reply, particularly in comparison to many other cryptocurrency exchanges. However, there’s no phone number listed on the site, and there’s no live chat option. Bitcoin.de tends to receive positive feedback from those who use it. In particular, many people feel that the trading platform is easy to use. This isn’t too surprising since it’s essentially an online marketplace rather than a speculative trading platform with advanced features. As such, Bitcoin.de is a good option for beginners. In terms of security, there have been no known hacks of Bitcoin.de. The vast majority of coins are kept in cold storage, and users are highly encouraged to use two-factor authentication. The use of an escrow service makes Bitcoin.de a safer way of buying and selling Bitcoin. A great deal of credibility can be attributed to Bitcoin.de due to its partnership with Fidor Bank and its willingness to abide by German regulations. However, some people have criticized Bitcoin.de for too easily surrendering user data to the German police when they had no warrant. Another criticism of Bitcoin.de is the lack of deposit payment methods it has available. If you’re looking for a safe and secure way to buy and sell Bitcoin in Europe, there aren’t many options better than Bitcoin.de. While it’s not a traditional Bitcoin exchange, it makes the process of buying and selling relatively simple thanks to its user-friendly interface. However, some traders will find it too simple and may want to seek advanced features elsewhere. Bitcoin.de also boasts a number of security features to provide peace of mind. While it’s also possible to buy and sell BCH and ETH, the only fiat currency supported is EUR. What’s more, the fees are quite high.